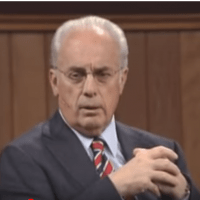 (JD Hall – Pulpit & Pen) John MacArthur, a wildly popular evangelical preacher, recently appeared on Ben Shapiro’s program, a wildly popular podcast host and conservative pundit. I am a fan of both. When I heard Shapiro was going to host JMAC on his weekend special show, I almost had a coronary from the excitement. The following is my review. I admit it. I have fantasies. I’m traveling down the road, and I see a black Lincoln Towncar (do they still make those?) on the side of the highway and I stop to help. When I do, the driver – now outside the car, looking at a flat tire -seems exasperated at his inability to figure out how to service the vehicle and get moving again. As I approach the car with a tire tool in hand from my pickup, the back tinted window of the Towncar rolls down and I see a little man with a Yamaka. It’s Ben Shapiro. I reach out and shake his hand and tell him I love the program. After I successfully change his tire (this is my fantasy, I can do whatever I want), we have time to talk. From there I say something like, “Say, Mr. Shapiro, would you consider yourself a good person?” And then, basically, my inner Ray Comfort takes over. I throw in some line from Isaiah 53 and Psalm 22 and other Messianic passages from the Old Testament. I explain to Shapiro how Jesus has Tabernacled among men, how he is the manna of life, how he’s the light of the world and living water, and other things from the Jewish cultic religion that Shapiro would recognize. I would explain the justification of faith belonging to Abraham and that Jesus was – and is – the best Jew who has ever lived. I would explain that Jesus is the Passover Lamb. I would explain that God basically took all hope away from Judaism when the Temple was destroyed, and now their bloodless, priestless, temple-less religion is just meaningless types and shadows and that Jesus is the real faith of Abraham. I explain that Jesus spoke to Moses out of the burning bush, how it was Jesus who led Israel through the wilderness as a cloud by day and pillar of fire by night. I explain that Abraham paid tithes to Jesus. I explain that Jacob wrestled with Jesus. I explain that Jesus stood in the fiery furnace with Shadrach, Meshach, and Abednego. And then, in my fantasy, we make fun of liberals and call some Democrat (as Shapiro likes to say) a “garbage human” and then I baptize him in the Yellowstone River. Usually, this daydream and imaginary conversation with Shapiro takes place during or after listening to his daily podcast, that is when he’s not on Sabbath for any one of the 139 (I’m rounding up) Jewish holidays that seem to come up and postpone the show. At this point, I’ve listened to Shapiro so much that I’m reaching the point I’m about to stop listening. I know where Shapiro stands on almost everything, and I’m already in agreement. The man is brilliant, cutting, and his attempts at humor are genuinely humorous. Shapiro is the kid who got wedgies and swirlies in High School, who told the bullies that he’d own all their world one day and who, low and behold, goes out and actually does it. The conservative political world is Shapiro’s oyster, and he deserves it. Those swirlies have to count for something. Ben Shapiro is the nerdy kid who’s the smartest guy in the room. I’d give a nickel to be that little man’s bodyguard for a day, just to hang out with him. My MacArthur fantasies are mostly gone at this point. I’ve met the man, stood in his office, and spoke with him. I really don’t like talking much more about that experience, because it’s too special to just blab about on a website. But, I’ve been able to have my conversation with the elder statesman. And although I know where MacArthur stands on almost everything, I probably will never get to the point I stop listening to him. He’s not givng his political opinions each week, but the words of life. That never gets old. Shapiro started bringing on weekend guests to discuss topics at large (like Joe Rogan does, but without the profanity marathon) several months ago and I’ve listened to most of them. MacArthur joined him on Sunday’s podcast.